Did you know that recy­cling just one alu­minum can saves enough money to run a TV for three hours or the equiv­a­lent of half a gal­lon of gas? There are no lim­its to the amount of times alu­minum can be recy­cled so what are you wait­ing for! With over 240 mil­lion tons of munic­i­pal waste pro­duced a year in the US we all need to do our part. 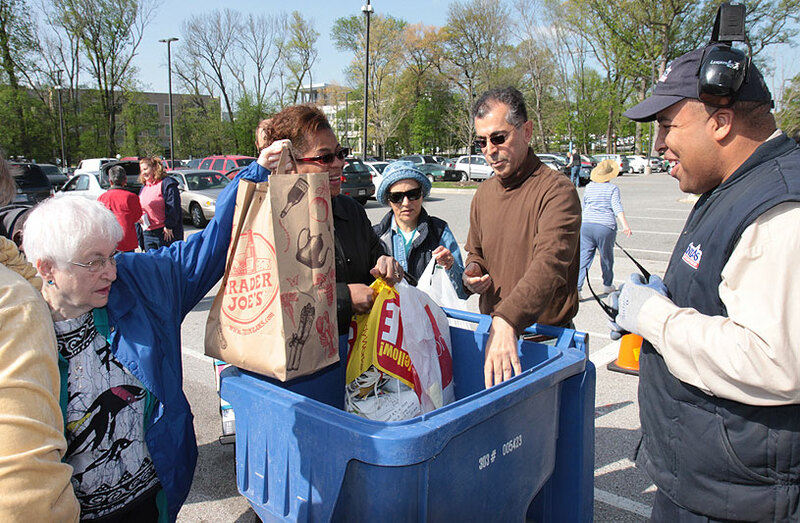 Howard County has achieved a 49.77 waste diversion rate. This is the recycling rate plus source reduction credits (maximum 5%) that Maryland Counties and Baltimore City earn through activities designed to reduce the amount of waste going to the waste stream. For the latest statistics on Howard County’s recycling achievements, visit the Recycling Facts and Figures page. County Recy­cling Pro­gram par­tic­i­pants may place their recy­clables all together. Metal cans, plas­tics, and glass bot­tles and jars can be com­bined with mixed paper and card­board, with­out any need for bag­ging or bind­ing the paper sep­a­rately. A blue cart, bin or see-through bag is all you need. Bags that are not see-through may not be used for recy­clables. Yard­waste should be placed out sep­a­rately on your recy­cling day. This method of col­lec­tion is con­ve­nient for you, and effi­cient for the County recy­cling haulers. Par­tic­i­pa­tion stud­ies in other juris­dic­tions have shown that the eas­ier it is for peo­ple to recy­cle, the more likely they will be to par­tic­i­pate in the recy­cling program. Waste Man­age­ment Recy­cle Amer­ica (WMRA) is under con­tract to Howard County for the pro­cess­ing and mar­ket­ing of recy­clables. WMRA oper­ates a state-of-the-art recy­clables pro­cess­ing facil­ity near Elkridge, which has the nec­es­sary equip­ment to sort recy­clables in prepa­ra­tion for sale to indi­vid­ual mate­r­ial markets.